The United Hospital Fund presented Distinguished Trustee Awards to 28 trustees from metropolitan area hospitals at a luncheon today at the Waldorf-Astoria Hotel. Howard Milstein was co-chair of the luncheon with Patricia Levinson. The honorees were recognized for their leadership, generosity, and extraordinary service to not-for-profit and municipal hospitals in New York City, nearby New Jersey, and Long Island communities. TD Bank (through its charitable giving arm, the TD Charitable Foundation) provided underwriter support for the 2012 Tribute to Hospital Trustees. Greg Braca, regional president of TD Bank, joined United Hospital Fund President James Tallon, Jr., and luncheon co-chairs Patricia Levinson and Howard Milstein in recognizing the 28 Distinguished Trustees honored at the event. 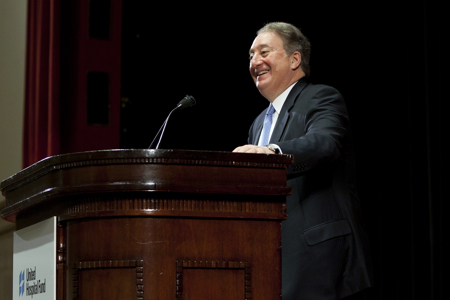 Mr. Milstein, in addition to being the chairman, president, and CEO of New York Private Bank & Trust and its operating bank, Emigrant Bank, is active in medical philanthropy. He joined the Fund’s board in 2005, and he serves as chair of the New York Blood Center and American Skin Association. He has also served on the board of Weill Cornell Medical College for more than 20 years. 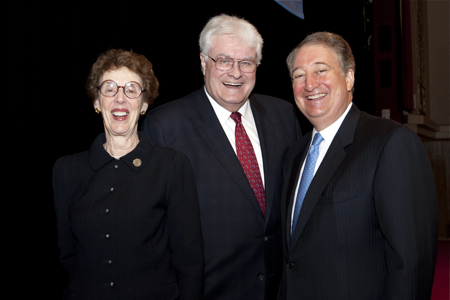 United Hospital Fund Award Vice Chair Patricia Levinson (left), United Hospital Fund President James Tallon (center), and Distinguished Trustee Award Luncheon co-chair Howard Milstein (right) at the Luncheon. This is the 22nd year the Fund has presented Distinguished Trustee Awards. The 28 honorees are all trustees from the Fund’s beneficiary not-for-profit hospitals, New York’s municipal hospital system, and hospitals participating in the United Hospital Fund/Greater New York Hospital Association quality improvement collaboratives. The trustees were nominated by their respective institutions. The United Hospital Fund is a health services research and philanthropic organization whose primary mission is to shape positive change in health care for the people of New York. A list of the honorees and the hospitals they serve is available at the United Hospital Fund website. Howard Milstein speaks at the United Hospital Fund Distinguished Trustee Award luncheon.